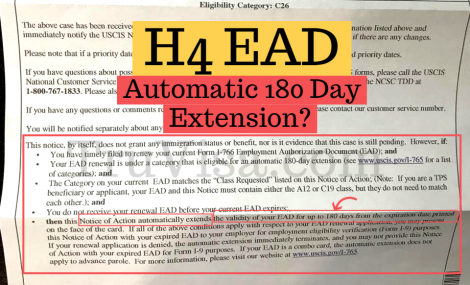 Can H4 EAD Get Automatic 180 Day Extension? H4EAD does not get automatic EAD renewal after its expiry. There are only some types of EAD work permits that are allowed to use the automatic 180 EAD extension but not H4-EAD. The automatic 180 day EAD extension that you have heard or read about is NOT allowed for H4 EAD category c(26). You cannot work until you get the renewed H4 EAD card in your hand. After Expiration of H4 EAD date, Can I continue Work for Some Days? No, you cannot work after expiration of your H4 EAD card validity. Its NOT true that you can work for 180 days especially with H4 EAD. You have to stop working the same day H4 EAD expires. Can I work if H4 EAD Renewal is in process? You cannot work if your existing H4 EAD card has expired and renewal is in process. You cannot remain on paid or un-paid leave either. Ideally, the job should be terminated by employer and you can rejoin once your get H4 EAD work permit. H4 EAD category is C(26) and it is not part of the automatic EAD extension allowed list: A03, A05, A07, A08, A10, C08, C09, C10, C16, C20, C22, C24, C31 and A12 or C19. The above shown image is notice of action (i797) sent by USCIS when you apply for any EAD extension including H4 EAD. It has a generic message about 180 automatic renewal available if your EAD application is pending in same category as the earlier one. Please note that this is a common message printed on this i797 for all EAD categories. 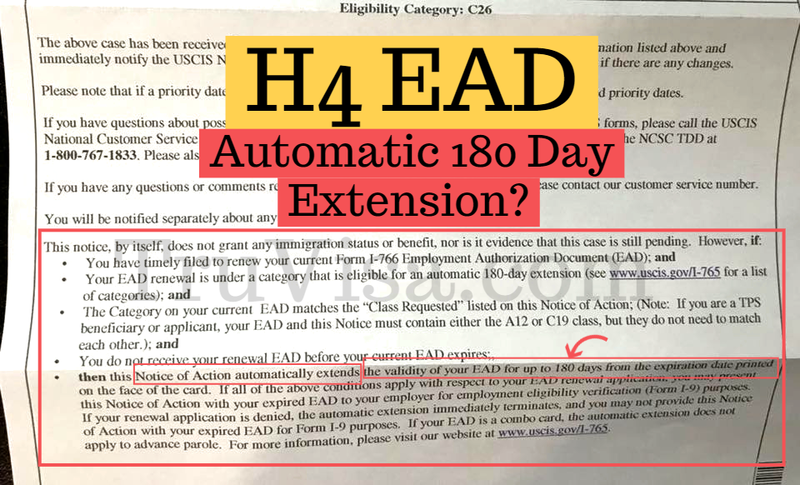 If you look at the allowed category list for automatic extension, H4 EAD (C-26) is not part of the list.